Summer 2015 is booking quickly! Okay, let’s “cut to the chase”… I was a tremendous opponent of strike indicator fishing for years. I argued nymphing “is not fly fishing.” I said “it will ruin the sport. 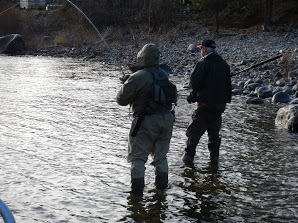 “It’s too easy.” “Pretty soon everyone will be doing it.” “It will screw up real fly fishing.” I said a lot of other things I don’t want to put into print… Having caught thousands of steelhead on swung flies since 1965 with an ardent passion bordering on insanity, I felt qualified to voice this opinion. Well, I have softened my position and I’ll tell you why…. There were four of us buddies fly fishing the Hoh a number of years ago for three days. 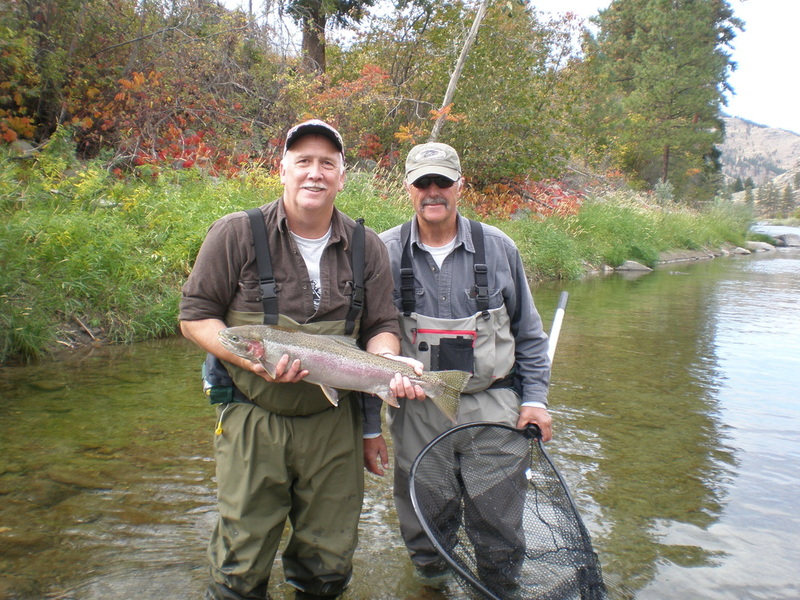 All experienced fly fisherman. The water was cold and we hooked zero. 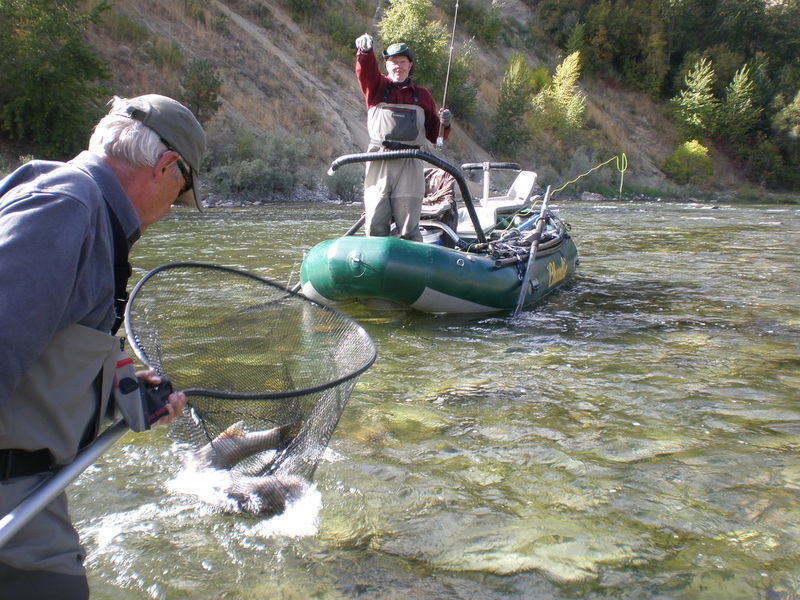 A guide from Montana was guiding two strike indicator fisherman, and while we were taking spey casting practice, they hooked 36. Now, if I’m swing fishing I don’t mind getting whooped 10 to 3; but, 36 to 0 is a whole different magnitude. I was beginning to weaken. A few weeks later I’m back on the Hoh and I watch Gordon Gracey and his wife catch four steelhead on casts that couldn’t have gone 15 ‘ using strike indicators….yeh, you know how many I caught….I talked to Gordon at the boat launch and he pointed out how low the water temperature was and that the Peninsula fish weren’t like the Skagit and Sauk fish and required the fly to slow down and be down in the strike zone and that the fish were not as aggressive…I was really getting weak; but, I’m stubborn and after all, I was the guy who argued long and hard against the practice, so I resisted. Then I moved to the Methow and while the salmon were spawning, the strike indicator fisherman with egg imitations were kicking my a—…. I couldn’t take it anymore. I decided if I’m going to the “dark side” I might as well get good at it and I went with a guide on my own river! Good move…took a lot of time off the learning curve. Now I am one! This is how it plays out. There are places where the “swing is the thing” like the Dean or the Thompson River in B.C. 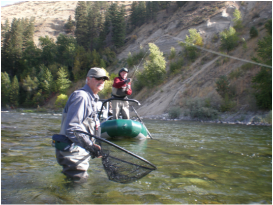 … there are times when the swing will produce on rivers like the Methow just as well as indicators…..I do both depending on timing and water temperatures. I also love to catch steelhead on dries when conditions allow. 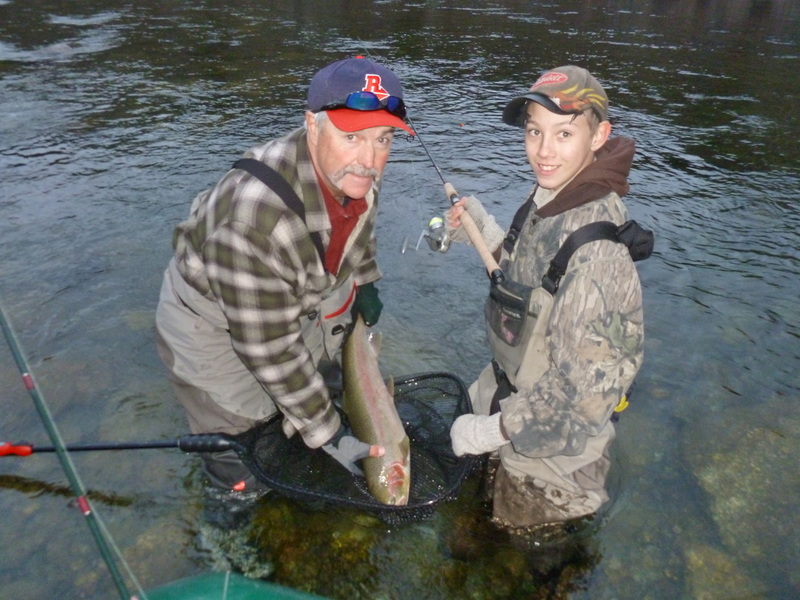 However, the reality is that over the long haul in small rivers, indicator fishing will out produce the swung fly. Wish it weren’t true. I’ve had 30 fish days on both the swing and nymphing. I have both rod setups including dries in my boat every day and I know what works. I let the customer decide …they can fish with Luke Skywalker or Darth Vader or both. Either way they’ll catch fish and have a good time! From a philosophical point of view, I’ve come to the conclusion it’s all fly fishing. Other steelheaders will argue for dry lines only with flies that copy natural patterns, using only natural fibers, trying to mimic the behavior of some bug. They might say “any fly with flash is not a fly , it’s a lure”. That’s okay. Everyone should fish in a manner that gives them the most enjoyment. Other than the Methow , my three favorite rivers are the Thompson, Skeena, and Dean. On those rivers , I only swing fish. If I am on other rivers like the Hoh or the Queets, I usually swing fish most of the time; but, will nymph my way down the river in between runs. On the Skagit or Sauk, I only swing. On the Methow, I do everything. If my customers want to fish dries, that’s what they fish with. I’m just happy to be on the water with a fly rod in my hand. As my senior softball friends say in greeting every season, “we are on the right side of the grass”. I live on the banks of the Methow River and only guide there, with a few exceptions. Depending on season openings and ice, I take bookings from approximately October 1 to November 15 and February 1 to March 31. You are welcome to bring your own rods and reels but most of my customers wind up using my equipment as it is specifically designed for our style of fishing. There will be 3 single hand rods and 2 switch rods in the boat at all times. Plus , enough 2 handed rods to make you dizzy. These need to be matched to the rod and method of fishing. If you are an experienced angler, by all means, bring your equipment. If you are not sure, use mine. 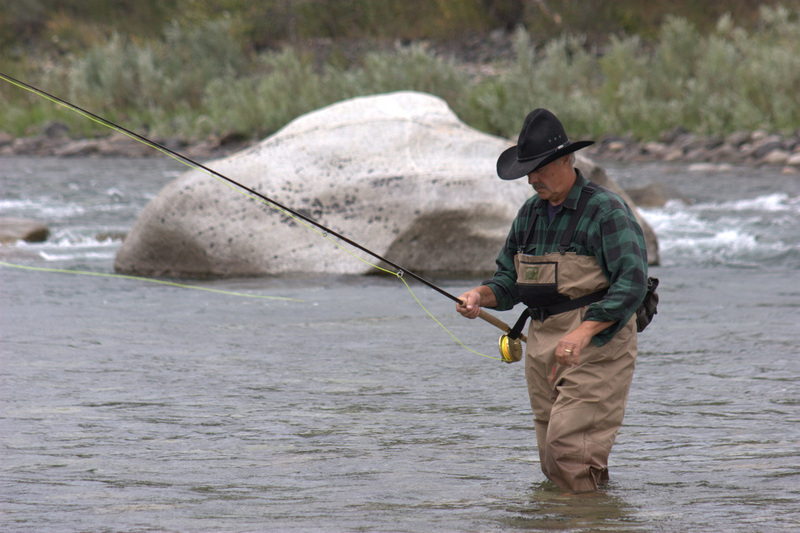 Though we usually fish from a raft, you will need waders or hip boots with rain pants….there is always a spare pair of waders at home, so no need to buy them. Bring em if you have em! Thermos: coffee and soup are provided by my wife. If you have special needs bring your thermos along.